The protagonist is a guy who is among the stupidest of the stupidest in the school. In this school, your grades can, under the supervision of teachers, take a virtual form to do combat! However, if you leave an examination half way, you get zero marks. A bright and cute girl, Mizuki Himeji, was having a high fever during the examination. Despite her potential to be the second highest scorer in the level, she obtained zero marks for having left due to her illness and is thus allocated to the worst class, class F.
As for Class F, the worst class… They have Japanese desks and seat paddings. Their blackboard is dirty and there is no chalk even! Someone complains that the legs of his desk are broken, so the teacher asks, “Didn’t we distribute some glue to stick wood together? Glue it back yourself later.” Another one complains that wind is blowing in from the broken window. The teacher says, “I got it. I will apply for plastic bags and invisible glue to fix it later.” There are spider webs everywhere, not a patch of the wall is clean. A unique moldy smell spreads across the entire room; it must be from the old tatamis used to tile the floor. This is the status of class F.
The protagonist feels displeased at such an arrangement, and seeks help from his friends to try to make a change through summoning war!! And they devise all kinds of plans to try to beat the famous class A, intending to get class A’s classroom and equipment if they win!! 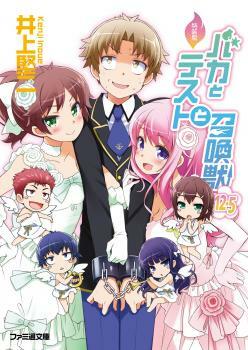 (Hideyoshi's no trap, he's a gender of his own). Either way, if you're looking to read something totally not serious, this is for you. I love this so much, I could start a rally that complains about how this is not the national light novel series of the country. Unfortunately, the country has yet to instate such a label so for now I'll just aim for president first. But the problem there is that I might die from stomach pain thanks to excessive laughter since I might go reread the whole series again. It's just THAT good. If you loved the anime, then you'll ADORE the series. This is great comedy series. I recommend it anyone who wants to have good laugh.